Three-peat is a contraction of the words three and repeat, which has been trademarked for commercial use by retired basketball coach Pat Riley. 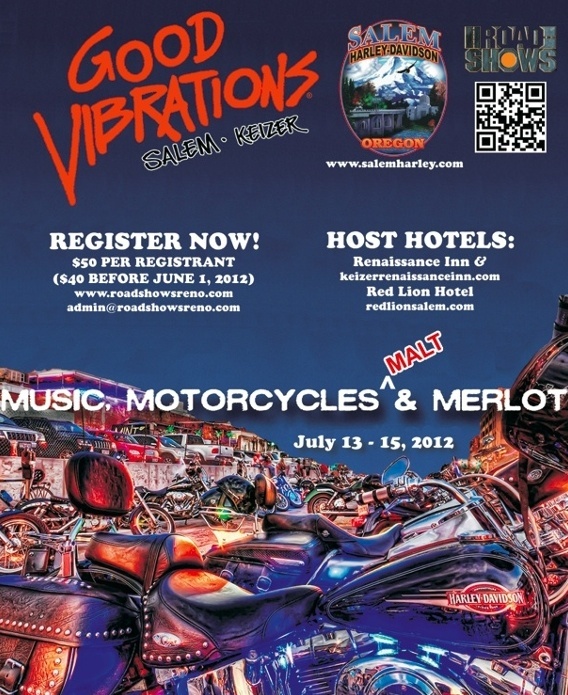 The Oregon motorcycle rally called Good Vibrations is set to “3 Peat” on July 13th. It’s three days of motorcycle fun in and around Salem/Keizer including festivities at Riverfront Park and Salem Harley-Davidson. Randy Burke, President of Road Shows Inc., (Reno Street Vibrations “fame”) is running at full throttle to make the third rendition of the motorcycle rally in Oregon the best. The rally will have bike competitions, bike shows, entertainment, concerts, poker runs, wine country tours and is expected to attract hundreds of motorcycle enthusiasts to the area. I’ve provided shout outs in the past for Randy Burke HERE about his efforts to make Street Vibrations a major success. His company, Roadshows Inc. is a private company categorized under Entertainment Promotion and located in Reno, NV. Online records indicate it was established in the ‘90’s and incorporated in Nevada. Current estimates indicate the company has an annual revenue of $500,000 to $1 million and they employ a staff of approximately 5 to 9. They are also a fully licensed entertainment booking agency, licensed private event security and event management company. In addition to Good & Street Vibrations, they produce events in Palm Springs, Lake Havasu, Mammoth Lakes, Myrtle Beach, SC and Milwaukee. They know how to make magic at a motorcycle rally! Photo courtesy of Road Shows Inc. Sometimes posts seem a bit like “Groundhog Day.” Have you seen the movie? It star’s Bill Murray and is often used as common reference to a situation the continually repeats. And speaking of “three-peat”… The Harley Owners Group (H.O.G.) 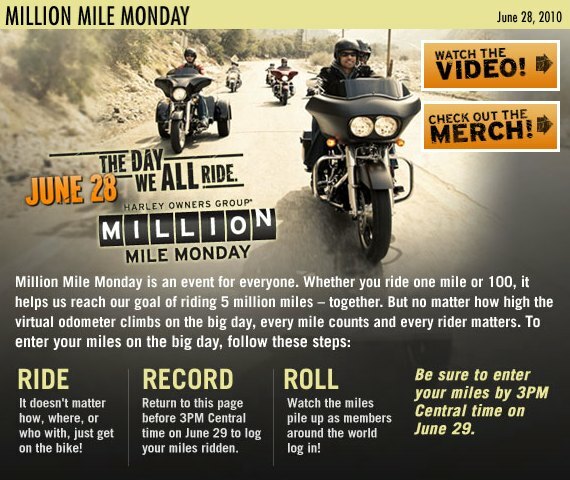 Annual Million Mile Monday will take place on Monday, June 28th. It’s a day which encourages all motorcyclists and in particular H.O.G. members to get out and ride. To participate it’s simple, just ride – ride to work, at lunch, around the block, or even take the whole day off to ride. Log on to the member only section of H.O.G. and register your mileage contribution. Non-H.O.G. members can still join up in time for the event. Photo courtesy of H-D and H.O.G.